There are media access control (MAC) protocols designed specifically for wireless sensor networks. INET has several such protocol implementations, alongside IEEE 802.15.4 models. This showcase consists of two parts. 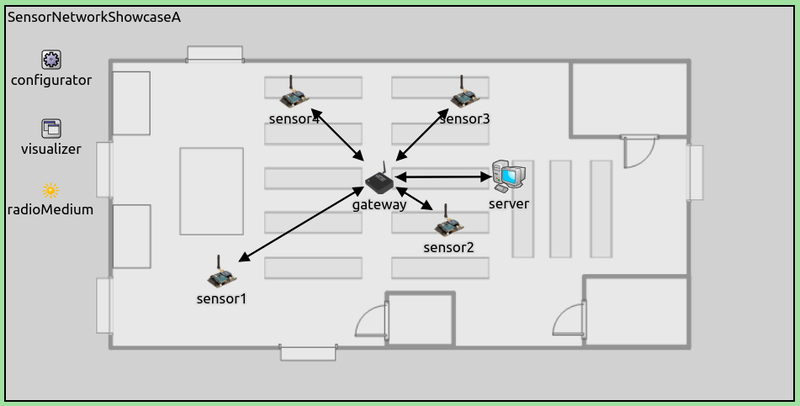 In Part 1, we demonstrate three wireless sensor network MAC protocols with three example simulations of a wireless sensor network. In Part 2, we compare the three protocols using statistics. Time-division multiple access (TDMA) based: These protocols assign different time slots to nodes. Nodes can send messages only in their time slot, thus eliminating contention. Examples of these kind of MAC protocols include LMAC, TRAMA, etc. Carrier-sense multiple access (CSMA) based: These protocols use carrier sensing and backoffs to avoid collisions, similarly to IEEE 802.11. Examples include B-MAC, SMAC, TMAC, X-MAC. This showcase demonstrates the WSN MAC protocols available in INET: B-MAC, LMAC and X-MAC. The following sections detail these protocols briefly. X-MAC is a development on B-MAC and aims to improve on some of B-MAC’s shortcomings. In B-MAC, the entire preamle is transmitted, regardless of whether the destination node awoke at the beginning of the preamle or at the end. Furthermore, with B-MAC, all nodes receive both the preamble and the data packet. X-MAC employs a strobed preamble, i.e. sending the same lenght preamle as B-MAC, but as shorter bursts, with pauses in between. The pauses are long enough that the destination node can send an acknowledgement if it is already awake. When the sender receives the acknowledgement, it stops sending preambles and sends the data packet. This can save time because potentially, the sender doesn’t have to send the whole length preamble. Also, the preamle contains the address of the destination node. Nodes can wake up, receive the preamble, and go back to sleep if the packet is not addressed to them. These features improve B-MAC’s power efficiency by decreasing nodes’ time spent in idle listening. LMAC (short for lightweight MAC) is a TDMA-based MAC protocol. There are data transfer timeframes, which are divided into time slots. The number of time slots in a timeframe is configurable according to the number of nodes in the network. Each node has its own time slot, in which only that particular node can transmit. This saves power, as there are no collisions or retransmissions. A transmission consist of a control message and a data unit. The control message contains the destination of the data, the length of the data unit, and information about which time slots are occupied. All nodes wake up at the beginning of each time slot. If there is no transmission, the time slot is assumed to be empty (not owned by any nodes), and the nodes go back to sleep. If there is a transmission, after receiving the control message, nodes that are not the recipient go back to sleep. The recipient node and the sender node goes back to sleep after receiving/sending the transmission. Only one message can be sent in each time slot. In the first five timeframes, the network is set up and no data packets are sent. 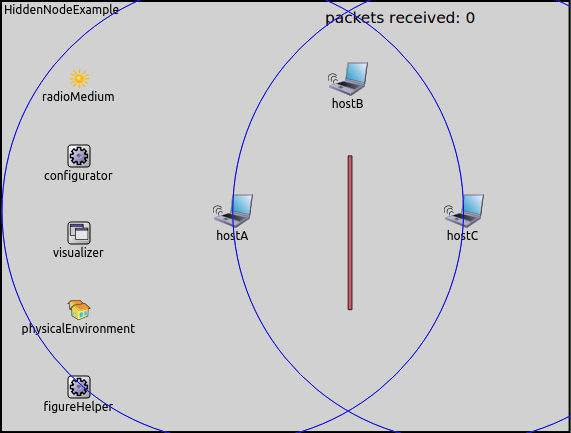 The network is set up by nodes claiming a time slot. They send a control message in the time slot they want to reserve. If there are no collisions, nodes note that the time slot is claimed. If there are multiple nodes trying to claim the same time slot, and there is a collision, they randomly choose another unclaimed time slot. The three MACs are implemented in INET as the BMac, XMac, and LMac modules. They have parameters to adapt the MAC protocol to the size of the network and the traffic intensity, such as slot time, clear channel assessment duration, bitrate, etc. The parameters have default values, thus the MAC modules can be used without setting any of their parameters. Check the NED files of the MAC modules (BMac.ned, XMac.ned, and LMac.ned) to see all parameters. The MACs don’t have corresponding physical layer models. 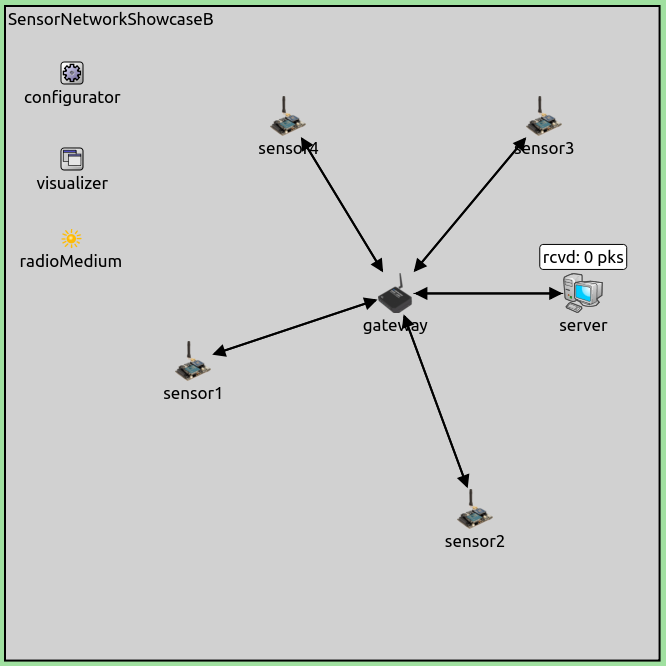 They can be used with existing generic radio models in INET, such as UnitDiskRadio or ApskRadio. We’re using ApskRadio in this showcase, because it is more realistic than UnitDiskRadio. INET doesn’t have WSN routing protocol models (such as Collection Tree Protocol), so we’re using Ipv4 and static routing. The showcase contains three example simulations, which demonstrate the three MACs in a wireless sensor network. The scenario is that there are wireless sensor nodes in a refrigerated warehouse, monitoring the temperature at their location. They periodically transmit temperature data wirelessly to a gateway node, which forwards the data to a server via a wired connection. Note that in WSN terminology, the gateway would be called sink. Ideally, there should be a specific application in the gateway node called sink, which would receive the data from the WSN, and send it to the server over IP. Thus the node would act as a gateway between the WSN and the outside IP network. In the example simulations, the gateway just forwards the data packets over IP. In the network, the wireless sensor nodes are of the type SensorNode, named sensor1 up to sensor4, and gateway. The node named server is a StandardHost. The network also contains an Ipv4NetworkConfigurator, an IntegratedVisualizer, and an ApskScalarRadioMedium module. The nodes are placed against the backdrop of a warehouse floorplan. The scene size is 60x30 meters. The warehouse is just a background image providing context. Obstacle loss is not modelled, so the background image doesn’t affect the simulation in any way. Note that the wireless interface module’s name is wlan in all host types that have a wireless interface. The term doesn’t imply that it’s Wifi, but stands for wireless LAN. The MAC-specific parameters are set in the configurations for the individual MACs. The next sections demonstrate the three simulations. BMac actually sends multiple shorter preambles instead of a long one, so that waking nodes can receive the one that starts after they woke up. sensor3 starts sending preambles, while the other nodes are asleep. All of them wake up before the end of the preamble transmission. When the nodes are awake, they receive the preamble, and receive the data packet as well at the physical layer (the mac discards it if it is not for them.) Then the gateway sends it to the server. Note that all nodes receive the preables and the data packet as well. sensor3 start sending preambles. sensor4 wakes up and receives one of the preambles (hence the dotted arrow representing a successful physical layer transmission), and goes back to sleep, as the transmission is addressed to the gateway. Then the gateway wakes up, and sends an acknowledgement after receiving one of the preambles. sensor3 sends the data packet, and the gateway forwards it to the server. Each node transmits in its own time slot, there are no collisions. Note that all nodes receive the control message (indicated by the physical link visualizer arrows), but only the destination node receives the data unit. In this section, we’ll compare the three MAC protocols in terms of a few statistics, such as the number of UDP packets carried by the network, and power consumption. In order to compare the three protocols, we want to find the parameter values for each MAC, which lead to the best performance of the network in a particular scenario. We’ll optimize for the number of packets received by the server, i.e. we want to minimize packet loss. We’ll run three parameter studies, one for each MAC protocol. 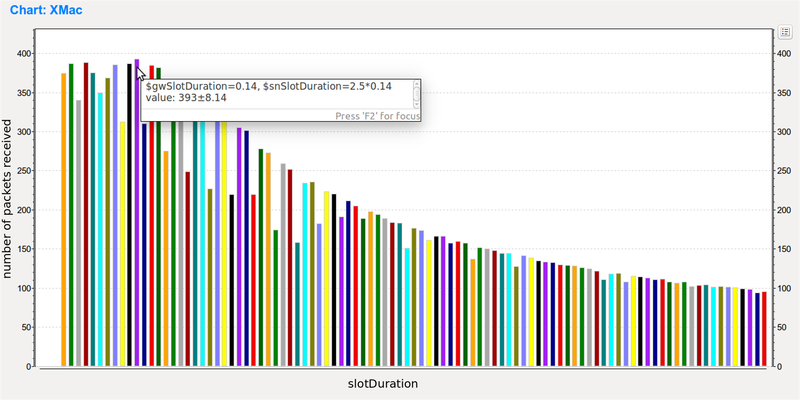 We want to optimize just one parameter of each MAC, the slot duration. Ideally, one would want to optimize multiple parameters in order to find a more optimal set of parameter values, but it is out of scope for this showcase. The choices for the values of the other parameters are arbitrary. The simulations will be run for 100s, and each iteration will be run 10 times to get smoother results. We’ll choose the best performing parameters according to the number of packets received by the server. In this base configuration, we set the simulation time limit, the number of repetitions, and turn vector recording off to speed up the runs. The results are plotted in the StatisticBMac.anf, StatisticXMac.anf, and StatisticLMac.anf files. The parameter studies for the individual MACs are detailed in the following sections. The sensors send 100 packets each during the course of the 100s, thus 400 packets total. It is apparent from the results that the network cannot carry all traffic in this scenario. The results also outline a smooth curve. We choose 0.19s as the best performing value for slotDuration. According to this, the optimal value for the gateway’s slotDuration is 0.14s (0.35s for the sensors), so we choose that. It is apparent from the results that the network can carry almost all the traffic in this scenario (as opposed to the XMac and LMac results.) 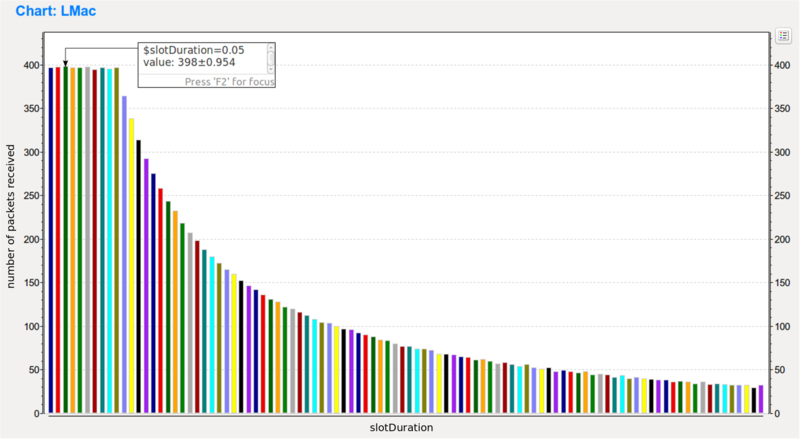 The best performing value for slotDuration is 50ms. Note that the lowest slotDuration values up until 120ms yield approximatelly the same results (around 400 packets), with the 50ms value performing marginally better. 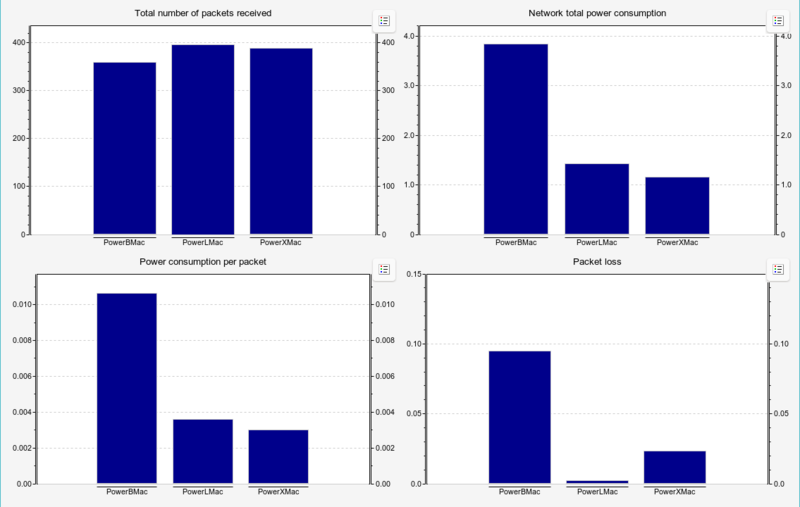 Choosing the higher slotDuration value would result in about the same performance but lower power consumption, but we are optimizing for the number of packets here. We will examine the three simulations with the chosen parameters in terms of power consumption. We want to record the power consumption of the radios in the wireless nodes. The SensorNode host type has an energy consumer submodule in its radio by default, SensorStateBasedEpEnergyConsumer. This module assigns a constant power consumption value to each radio mode and transmitter/receiver state. Note that the values for each state are parameters of the energy consumer module, and don’t come from other modules (such as the radio), so they need to be set correctly in order to obtain accurate power consumption results. SensorStateBasedEpEnergyConsumer has default power consumption values typical for wireless sensor nodes, thus we leave module’s parameters on default. SensorNode has an energy storage submodule by default, IdealEpEnergyStorage. This module keeps track of the node’s energy consumption. It stores an infinite amount of energy, and cannot get fully charged or depleted, and it is useful if we only want to model and measure power consumption, but not energy capacity, charging, etc. Total number of packets received: All the packets received by the server. The UDP applications in the sensors each send 100 packets during the course of the 100s simulations, for a total of 400 packets. Packet loss: Total number of packets received / total number of packets sent, thus how many packets from the 400 sent are lost. From this, it is apparent that LMac carried the most packets, and BMac the least. BMac consumed significantly more power than the others. All three carried around 90-100% of the traffic (BMac 90%, XMac 99.25%, LMac 97%), thus BMac has significantly more power consumption per packet. The conclusion is that in this scenario, with the selected parameter values, XMac turned out to be the most energy efficient MAC protocol, although LMac carried a bit more traffic.